A downtown Mobile restaurant hosts an over-the-top drag brunch that, for those with a wild sense of humor and a bottomless mimosa, is a rollicking good time. Champagne Munroe’s pink patterned one-piece and blue wig wow the patrons armed with tips at OK Bicycle Shop. Dollar bills. Mimosas. Wigs. Pop songs. Lipstick. 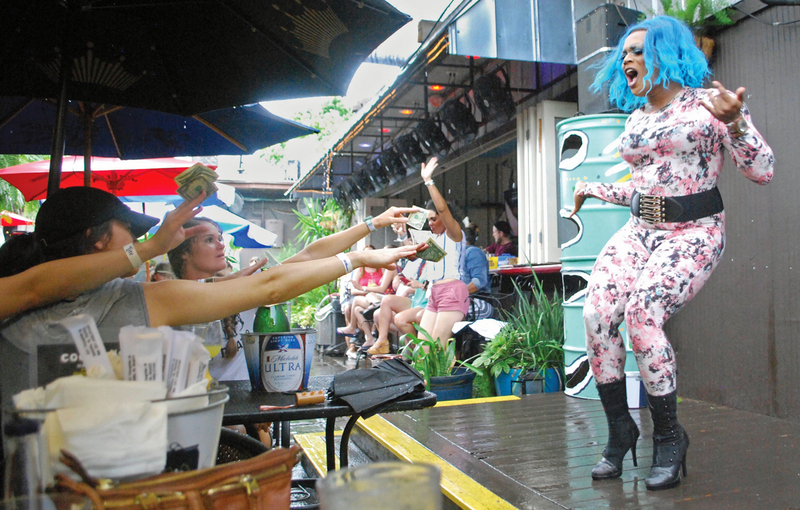 Welcome to Mobile’s Drag Queen Brunch, hosted by OK Bicycle Shop on Dauphin Street the first Saturday and third Sunday of each month, rain or shine. The brunch features a special menu and copious amounts of Champagne and orange juice, but the main attraction is the Wakettes — Champagne Munroe, Jawakatema Davenport and Zamareyah Dawn. Dressed in elaborate costumes, stilettos, flawless makeup and wigs, the ladies lip-sync to well-loved pop hits while dancing, flipping and even performing “death drops” — on-purpose falls that result in the drag queen on her back with a leg folded underneath — all while collecting hundreds of single dollar bills being thrust at them by excited bachelorettes and birthday girls. Drag is an adrenaline rush like any other performance, Davenport says, comparing the experience of a drag show to any other concert or theater production. Zamareyah Dawn performs in an extravagant black and white ensemble complete with full-face makeup, floral jewelry and glistening thigh-high boots. Drag can be a full-time career for some performers, but Davenport says most of the money she makes at a show is invested back into costumes, jewelry, makeup and wigs. Davenport was born and raised in Mobile and in 2003 moved to Birmingham, where the drag scene was already booming. She performed “Toxic” by Britney Spears as a joke at an amateur night but ended up winning the competition. Davenport moved back to Mobile in 2007, and says the community has since welcomed the drag brunch sensation. The regular event at OK Bicycle Shop began as a one-time fundraiser for a local charity.